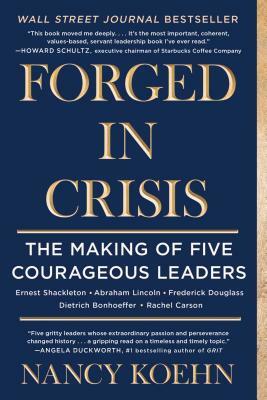 An enthralling historical narrative filled with critical leadership insights, Forged in Crisis, by celebrated Harvard Business School historian Nancy Koehn, spotlights five masters of crisis: polar explorer Ernest Shackleton; President Abraham Lincoln; legendary abolitionist Frederick Douglass; Nazi-resisting clergyman Dietrich Bonhoeffer; and environmental crusader Rachel Carson. What do such disparate figures have in common? Why do their extraordinary stories continue to amaze and inspire? In delivering the answers to those questions, Nancy Koehn offers a remarkable template by which to judge those in our own time to whom the public has given its trust. She begins each of the book’s five sections by showing her protagonist on the precipice of a great crisis: Shackleton marooned on an Antarctic ice floe; Lincoln on the verge of seeing the Union collapse; escaped slave Douglass facing possible capture; Bonhoeffer agonizing over how to counter absolute evil with faith; Carson racing against the cancer ravaging her in a bid to save the planet. The narrative then reaches back to each person’s childhood and shows the individual growing—step by step—into the person he or she will ultimately become. Significantly, as we follow each leader’s against-all-odds journey, we begin to glean an essential truth: leaders are not born but made. In a book dense with epiphanies, the most galvanizing one may be that the power to lead courageously resides in each of us. Whether it’s read as a repository of great insight or as exceptionally rendered human drama, Forged in Crisis stands as a towering achievement. Nancy Koehn is an historian at the Harvard Business School where she holds the James E. Robison chair of Business Administration. She has coached leaders from many organizations and speaks frequently at the World Economic Forum in Davos, the Aspen Ideas Festival, and the World Business Forum. An accomplished author and scholar (she earned her MA and PhD degrees in history from Harvard), she spent ten years writing Forged in Crisis, her first book aimed at a popular audience. She lives in Concord, Massachusetts, and is a dedicated equestrian. "Leadership is difficult to define, but we know it when we see it. At a time when it has become almost invisible at the national level, Nancy Koehn has performed the invaluable service of reminding us what it looks like in five superbly told tales of inspirational human courage. This book is dense with epiphanies that defy our current cowardly condition." "A remarkably insightful book, written in a style that is consistently engaging and absorbing, which reminds us that leaders are made not born, and that the crucibles from which they emerge are, above all, tests of character . . . This book is a wonder—exactly the leadership roadmap needed for these challenging times." "This book moved me deeply and will stay with me. Forged in Crisis is a compelling historical work and a vital analysis of the skills required to lead in the most important—and often dire—situations." "As important and inspiring as it is urgent." "A double triumph, artfully telling us the stories of five major historical figures while also providing wise insights into how they seized upon crises to grow as leaders. Each of the portraits will help leaders of today in coping with rapid, turbulent change. And here's an extra bonus: they are great reads." "A close analysis of five gritty leaders whose extraordinary passion and perseverance changed history . . . a gripping read on a timeless and timely topic!" "Emotionally gripping—so much so that it's easy to forget one is reading nonfiction. The scenes have the pull of a great novel, continually coaxing us to turn pages." "Koehn's well-written and incisive study helps to show us the way to a better nation. . . This is a very perceptive look at leadership in the modern era that taps leadership qualities from the past." "An outstanding rebuttal of the myth that leaders somehow have different DNA than ordinary people. [Koehn's subjects] ought to inspire every aspiring leader to rise to the occasion."